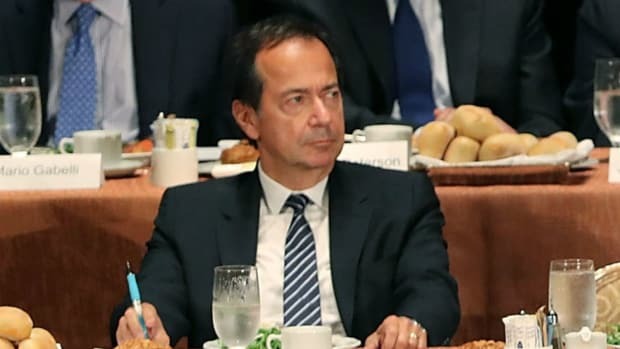 Last month, John Paulson sat down with his investors and told them he wouldn&apos;t personally be putting any more money into his worst-ever investment thesis, gold. This pronouncement came several months after Mr. Paulson made clear he didn&apos;t want to talk about the shiny stuff anymore, since all of his other investments are doing swimmingly and because he is basically the only person still losing money on his chastened-but-still-extant belief that his gold investments, while down 60%-plus this year, will richly reward him when people realize that all the Fed has been doing for the last five years is setting us up for one hell of an inflationary headache. Well, if he&apos;s going to keep his new pledge, J.P.&apos;s going to have to ignore what must look to him like some pretty attractive prices for the precious metal: After looking briefly like it had maybe kinda sorta hopefully turned a corner, gold went and had its worst November since the Carter administration. Gold prices dropped 5.5% in November. The declines help put gold on track to end 2013 in negative territory, disrupting a 12-year winning streak that saw the precious metal set price records…. Gold achieved that rally on concerns that the Federal Reserve&apos;s attempts to boost the U.S. economy in the wake of the financial crisis would lead to higher inflation or a weaker dollar. In either scenario, gold is perceived as holding its value better than other investments. Now the U.S. central bank has indicated that it would like to wind down its monthly bond purchases, which would lessen the risk of either high inflation or a weak currency. The Fed has said it would act if the economy shows steady growth. Nor was gold the only way to lose a whole bunch of money preparing for the (now apparently receding) possibility of an inflatiopocalypse. Treasury Inflation Protected Securities, or TIPS, have handed investors a loss of about 8% so far this year. And with only one month left to go, this market is poised for its worst year since its inception in 1997…. J.P. Morgan expects inflation to remain tame next year, seeing year-over-year CPI running no higher than 1.7%. That, alongside an expected 120 basis point rise in real yields, translates into a -8.4% total loss on TIPS in 2014.